This encounter led Michael on an exciting new journey which eventually led to his being appointed rector of Christ Church in Jerusalem. 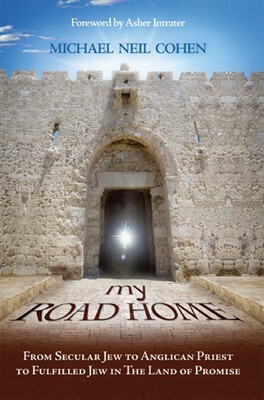 Michael believed this was the final chapter of his “road home.” But years later, when forced to leave his position, he and his wife applied to make Aliyah (become citizens of Israel). Miraculously, their request was granted in six weeks’ time; and so began the true final chapter—and maybe the happiest—of Michael’s life. Sadly and unexpectedly, Michael died in 2012. This revised edition tells the story of his last years and the amazing details of how God brought his life full circle. It also tells the moving story of how the Lord helped his widow, Fran, face a future without him, in The Land of Promise. 2.A Yid and a Yold I Am, Oy Vay! 8.So Now a Nudnik I Become—Oy! 12.Klutz I Am Not! Nor Yet a Chasid! 13.Shlichah! This Is Israel! This Is Israel? 14.Finally—A Citizen of “The Land”! This book tells of Michael’s personal journey of faith, identity, and destiny. His journey was part of a greater historical process: the restoration of Israel and the Church. I got to know Michael in the last stage of that journey, the part in which he felt he had come home to true faith in God, to Yeshua (Jesus) as both Son of God and Son of David, to the land of Israel, and to his own identity as a Messianic Jew. Again it was as if his coming into unity with his own heart was part of a greater historical process of reconciliation and restoration between Israel and the Church worldwide. For the last nine years of his life, we had the privilege of knowing Michael as part of our congregation, Ahavat Yeshua, in Jerusalem, and as part of our board of our board of directors at Revive Israel Ministries. Despite his age, wisdom, and maturity, there was something childlike in Michael’s wonder and joy at having found peace in his own identity. He seemed to be continually refreshed and excited during those years. He invested much of his time in one-on-one sessions with younger men in the community. He listened to them and was really concerned for them. They felt it, and appreciated it. It is both amazing and fitting that his dear wife Fran found the unpublished final chapter on Michael’s computer after he went on to be with the Lord. She waited two and a half years before mustering the strength to republish this third edition with the final chapter. What a great ending to a great book about a great man on a great journey! Like many others, I was privileged to be called one of his friends. Michael Cohen, now retired, served as an Anglican Priest in both England and Israel before he and his wife, Fran, made their permanent home in Israel in 2003. He has an international teaching ministry, and Fran teaches traditional Israeli dance, and how to use it as an act of worship.